The common stereotype of the polite, restrained midwesterner entirely breaks down in a little sliver of insanity called Lincoln, Nebraska. All the people have the reserved countenance and robustness of the God-fearing flatlander, yet that only serves to hide the real truth: These people are nuts. Is it football? is it the water? What is it about Lincoln? Driving a shiny orange R8 across the country brought attention in every corner, but nowhere else did it raise as much notice as in that football-stadium-with-a-city-attached known as Lincoln. From the moment we dropped off the Interstate we were surrounded on all sides by gawkers. They leaned out of cars, they jumped up and down on the sidewalk, and they did all they could to let me know they loved my (well, Audi's) new car. It wasn't even the polite two-finger-off-the-wheel salute you normally get from most Midwesterners. Whole hands reached out for the car, like zombies do for tasty human thinkmeat in horror films. My cousin and his wife set out a beautiful table of meats and cheeses upon our arrival and I could barely start to enjoy my dinner before it became clear I'd have to move the car from his corner as cars and people circled the block like sharks hoping for a better view (or more). I didn't call, but nice try. 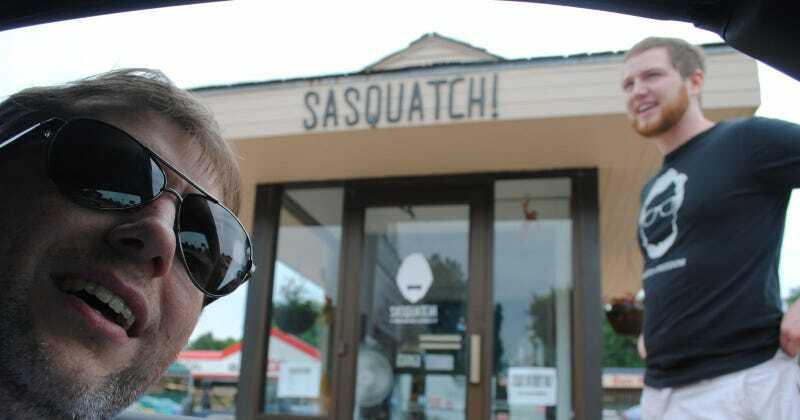 That same morning I took a trip out to Sasquatch Bakery, where my cousin's wife Allison makes what I can conservatively say are the best cookies in the world, including one called the Salty Dumptruck which is topped with pretzels and potato chips. After a quick ride around the block I was all set to leave when one of the employees at the connected Honest Abe's burger joint literally ran out of the restaurant, curious why the hell there's a brand new R8 in the driveway. Then he started jumping up and down. "Wait… Jalopnik? You're MATT HARDIGREE!" he screamed. This caused my cousin to burst into laughter as, up to this point, he wasn't entirely sure anyone would know who I was. I should mention, also, that perhaps because of the unrepentant strangeness of Lincolnians (Lincolnites?) I love hanging out there. Next time I'm bringing a Saturn, though.